Welcome to another Close to My Heart Blog Hop. The blog hop is a loop so if you are starting here you can just continue through until you are back here again. This month we are featuring the November Stamp of the Month: Around the Block. 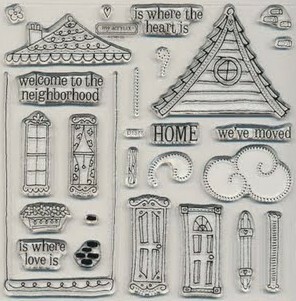 It is a set of 26 stamps that work great for home and family pages. Now I know there are some of you who are going to love this stamp set but it just wasn’t for me. I took a different approach and used the cloud and swirl stamps as the background for this card and used the shutters to make my own window instead of using the house. The card layout is from Wishes. The frame was cut with my Lyrical Letters Cricut cartridge. The owl in the window is from the Dream Big stamp set. You will also notice from this picture that although my card is standard size, it opens to the side instead of flipping up. Ink colors used are: Twilight, Sorbet, and Olive. Ribbon is from Sorbet Collection and Designer Twilight. Now hop on over and visit BETH’S BLOG ! If you get lost along the way go to this post for a complete updated list. 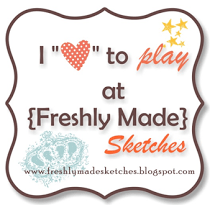 And to celebrate we are having a CTMH 2009 World Cardmaking Day Blog Hop! This is a great group of consultants who will be sharing some wonderful cards with you today. It’s a round robin hop so you may start here or if you have come from Debra’s blog you are on the right path and welcome! I discovered the Create-a-Shade Pearl Paint when making this card. I used a paint brush to apply the paint to the B&T Duo paper. It gives it such a beautiful shimmery shine! I also like using the Creative Basics when making cards. It comes with bulk ribbon and paper to make sets of cards. This combined with the Wishes card idea book makes for quick cards at a reasonable price and is this paper is perfect for some funand contemporary Christmas cards. I have two pictures of the card to try and show you how much it shines. Give it a try! Products used are a CTMH: Creative Basics – Jingle (paper & ribbon), Wishes, Create-a-Shade Pearl Paint, White Daisy Brads, White Daisy Cardstock, Juniper Cardstock, Holiday Jingle Stamp Set, Tulip Ink, and Sparkles. Now go to Kathleen’s blog to continue hopping! I can’t believe it’s the first of the month again! Before you know it, it will be Christmas – which is the theme of the October Stamp of the Month. The set is called Holiday Warmth and contains 11 stamps including the one I used on the card below. Enjoy the blog hop! Products used are all CTMH: Evensong B&T Duo Paper, Colonial White Cardstock, Cranberry Cardstock, Holiday Warmth Stamp Set, VersaMark ink, Gold Embossing Powder, Colonial White Ricrac, New England Ivy & Cranberry Markers, and Wishes Card Confindence Program. Now go check out Jessica‘s Blog and see the layout she made with this stamp set!